Dining on a Dime - Part 2: Specials! After many years of dining out and scrutinizing other menus, I'm convinced that Happy Hours are probably as the restaurants that offer them. Some have ridiculously good deals, some don't. Some include food, some just beverages, and some even have a whole separate menu devoted just to the occasion. For our third installment of Dining on a Dime, we've decided to expose another great way to stretch your dining dollars, Happy Hour. First, your goal is to find a Happy Hour that includes both food and drinks for maximum savings. Look for restaurants that offer cheap appetizers or even small portions (mini-meals) of their regular entrees for a value. Then, ensure that the restaurant is also offering a good deal on drinks. We're not talking $1 off Miller Lite, but full-on deals on a variety of beverages, so that everyone in your party can participate. Thrifty Hipster is your friend in locating Happy Hour deals. As a website dedicated to finding Happy Hour deals, their whole goal is meeting your needs. You can search by location, date, or even your favorite bar to see what specials are being offered. Once you decide where you're going, make sure you specify that you're there for Happy Hour, so you don't mistakenly sit in the restaurant if Happy Hour's only offered at the bar, etc. Additionally, some restaurants offer both an earlier Happy Hour and a later Happy Hour, so if you can alter your dining time off the beaten path a bit, you can save big bucks! Here at Woolley's, we love Happy Hour and offer the following deals between 4pm - 6pm, Monday through Friday. So stop on by this week and get happy, and good luck scouting out the best Happy Hour deals in town! We're beyond excited that 'Restaurant Week' has been expanded into a multi-annual affair! After our foray into this tradition in March and again in July, Woolley's has this down. As such, we've got some great summer fare planned to delight your palette! For those of you unfamiliar with Restaurant Week, it is a week-long celebration put on by Mpls. St. Paul Magazine during which participating restaurants present fabulously priced meals for lunch, dinner, or both. Lunch options are priced at $10 or $20 while dinner options are priced at $15 to $30. These multi-course meals sometimes come with an optional wine flight that may be purchased separately to pair with the meal. Restaurant Week is a great way for restaurants and their chefs to showcase their menus and attract newbie patrons to their locale. For this latest installment, Restaurant Week will run from October 23 to 28. Once again, Woolley's will celebrate Restaurant Week with offerings for both lunch and dinner! Adhering to the $20 and $30 price points, Woolley's has six separate entrée choice options slated for lunch and dinner respectively. Lunches start with our bountiful soup/salad bar and include a complimentary glass of house wine or non-alcoholic beverage. Dinner begins with our house French Onion Soup or choice of salad, and all meals are sweetly finished with three options for dessert. Also, while we do not have wine flights, we are offering 50% off any bottle of wine in celebration! Everyone knows that the best things in life are free, right?! It should be no different in your dining experiences. Often, people assume that they should only be granted a free meal or a discount if they experience a service shortcoming. What about specials and freebies that simply require you to show up on a certain night or order a certain item? That's a whole new ballgame! Our second recommendation for dining on a dime, is to look for deals! Here at Woolley's, we offer deals on Wednesday and Sunday evenings in the form of Wine Lovers Night. From 5:30 to 10pm on those days, any bottle of wine off our award winning list is half off with your dinner entree purchase. We also offer a Tri City Passport Program that gives patrons the opportunity to dine at Woolley's and our two Tri City sister restaurants to earn punches on their passport cards. Once the card has been stamped for each location, diners will receive a free dinner at the Tri City restaurant of their choosing. A great way to learn about your favorite eateries' specials and freebies is to follow them on Facebook, twitter, and/or sign-up to be on their mailing lists. Good luck and happy eating (and saving)! As a participating Open Table restaurant, Woolley's diners have the option to make online (or mobile) reservations. 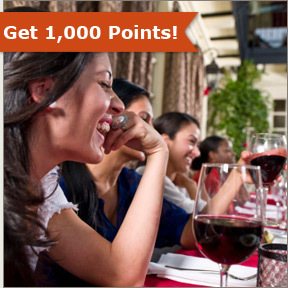 Then, they earn Dining Rewards Points when they honor those reservations at Woolley's and other participating Open Table restaurants. By making and honoring only two reservations that fall in any of the above timeframes, you can earn a $20 Dining Cheque. (Open Table rules and restrictions apply, so make sure you review the information on their website). That's just one easy way to stretch your dining dollars!